What remained from Saturday’s great Porterhouse was what some consider the finest part of the steak, the fillet. It weighed 8 ounces, just enough to add to an assembly of sauteed vegetables into what is for some unknown reason called Hash. Most often, be it beef, lamb, or chicken, leftovers turned into the next evening’s Hash is a dinner we look forward to, as we surely did last evening. With the assortment of fresh vegetables, it is a splendid one plate dinner. 1. Prepare the first 6 ingredients as suggested. Place each in individual bowls. 2. Heat a small saucepan with 1/3 cup of Water. When it begins to boil, lower the heat to a simmer & add the Demi Glace. Whisk until dissolved to a rich stock & set aside. 3. Heat a large saute pan, add the EVOO & Butter (adding more if required). Saute the vegetables one at a time, as each is cooked, add to a large bowl. Do not cook the Porterhouse, but add it to the bowl. 4. 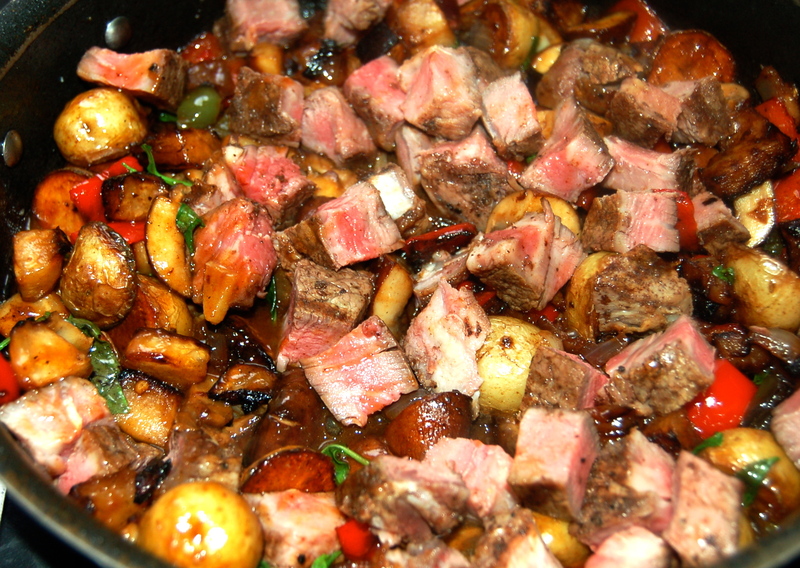 Remove the contents of the bowl to the saute pan, add the enriched stock & gently toss it together. Sprinkle on the the Basil.